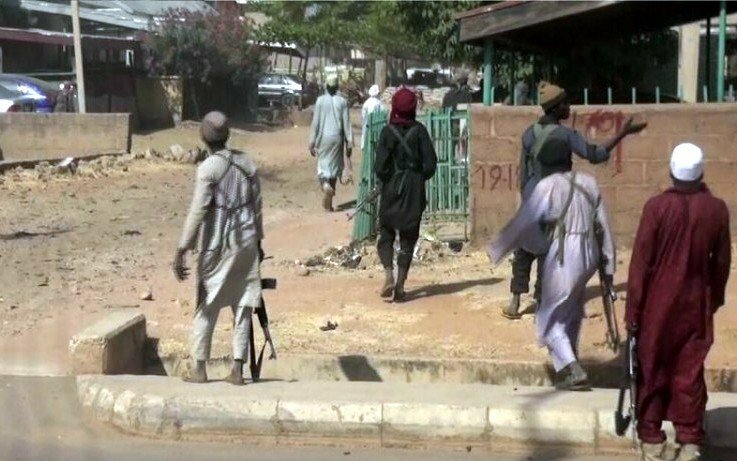 Some suspected members of the Boko Haram terrorist group have killed four persons and abducted four women from Kutuva village in Nigeria’s northeast Borno State. The terrorists on six motorcycles attacked the village on Tuesday, a statement by a spokesman for the army, Colonel Sani Usman said. After the attack, the local vigilante in Kaya mobilised immediately to the village and trailed the terrorists up to their suspected hideout located somewhere south of Sabon Garin Bale. The vigilante members engaged the terrorists in a gun battle, before they escaped into a nearby bush. The vigilantes, however, destroyed the terrorists’ camp and took down all hoisted Boko Haram terrorists’ flags. They also recovered three Fabrique Nationale (FN) rifle magazines, two AK-45 rifle magazines and 24 rounds of 7.62mm (NATO) ammunition. Colonel Usman said that the vigilantes also rescued an 11 year old girl who stated that she was abducted by the terrorists from Batha village. “Effort is ongoing to trace and rescue them,” he said.